The aromatics are $8.05 for 2 ounces, $29.90 for 8 ounces and $59.80 for 16 ounces in California*. Outside California, the prices are $7.00 for 2 ounces, $26.00 for 8 ounces and $52.00 for 16 ounces. Cavendish select combination, containing real Cherry, Medium Strength. Full Aromatic. A traditional Burley mixture containing over 30 different tobaccos. -Light Aroma with medium strength. Medium Aromatic. This is a Cavendish Mixture. It is a smooth aromatic mixture-Nice change. Rich Flavors. Full Aromatic. Smooth Cavendish mixture containing both dark toasted tobaccos and light Virginias. It is a variation of Bob's Best. Medium Strength. Full Aromatic. Is a Cavendish mixture we developed to celebrate our 20th year in business. It is a long-time favorite-Unique Flavor. Medium Aromatic. This is our long time favorite all black Cavendish containing Green River Dark Toasted tobaccos . It has full flavor and can be smoked straight or used to sweeten a mixture. Full Aromatic. This is a mild English blend with a touch of aromatic black Cavendish for flavor and aroma. This is a great transitional tobacco for smokers who want to take the next step from an aromatic to an English blend. This is a Burley based Aromatic with a very distinctive flavor and aroma. Medium Strength. Medium Aromatic. 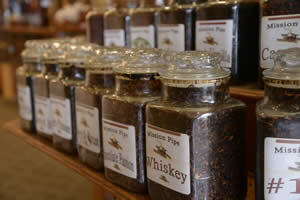 This blend was developed for those who enjoy a rather full-bodied mixture which has a sweet flavor and a great aroma. It has a rich, pleasant room note. Is an all Golden Virginia with vanilla. Medium flavor. Medium Aromatic. This is an all Burley blend for those who like burley without the bite. Medium to light in flavor. Medium Aromatic. A superior blend of Virginias, Burleys, and mild Black Cavendish flavored with a unique combination of chocolate and vanilla with a hint of port for a delightful smoking experience. Is a new blend we added in 1997. This Cavendish mixture is flavored with Scotch Highland Whiskey. Light to medium in body with great flavor and aroma. Medium Aromatic. This is a loose cut, golden Cavendish with a hint of fire-cured black tobacco. It is a light aromatic with hints of vanilla. Non Aromatic $9.20 for 2 ounces, $34.50 for 8 ounces and $69.00 for 16 ounces in California*. Outside California, $8.00 for 2 ounces, $30.00 for 8 ounces and $60.00 for 16 ounces. This is an intriguing mixture of many different leaf tobaccos with the addition of a slight amount of shade grown Connecticut Valley cigar leaf- a unique flavor enhancer adding a new dimension to tobacco blending. It is a mild, quality tobacco with no bite and a pleasing aroma. English Blends $9.20 for 2 ounces, $34.50 for 8 ounces and $69.00 for 16 ounces in California*. This classic English blend brings together Orientals, Black Cavendish ,Mexican Burleys and Cyprus Latakia resulting in an exotic flavor, uniquely its own. This distinctly non-aromatic blend produces an astonishing array of refined flavors ranging from mild to medium strength. This is a true Balkan mixture and is our biggest selling English mixture – a long time favorite. Second Breakfast is a medium bodied English tobacco blend. A touch of an aromatic Virginia flake gives it a creamy, smooth taste with no bite. This is our strongest English tobacco blend. It has a base of Virginia and Orientals and features a good amount of Latakia and Perique for a rich, full-bodied taste. This is not for the faint of heart.